I made this card for today's SCS Sketch 193. 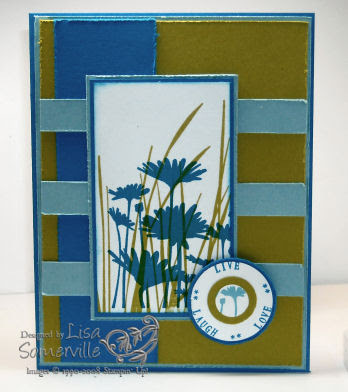 The flowers were stamped in Pacific Point on white card stock, then I stamped the grass from Inspired by Nature over them with Kiwi Kiss. I used my JustRite Small Words and C-30 Stamper to create the Live-Laugh-Love. Don't forget to stop by the JustRite Blog and vote in the Stampin' Champion Contest - here's my entry for the final round. Voting is open until Friday - thanks so much for your support!